During a discussion with a friend last week, I was asked a rather hefty question. My friend asked, "When you make your DIY Dog Mom Projects and they don't sell, does it frustrate you?" I'll be honest. This question could not have come at a more crappy time. 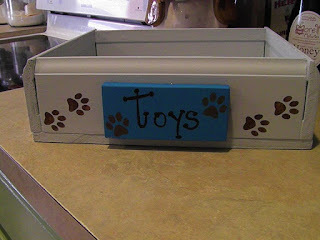 I posted a few DIY Dog Mom Projects the week prior that did not sell. I pondered the question for a bit. Then I replied with, "Sure. But. I can't let that bring me down. Some pieces will sell. Some won't." A wise woman told me decades ago, "Failure is not the opposite of success. Failure intertwines with success." I cringe at the word failure, but that's what the wise woman told me decades ago so I'm using the word for lack of a better word. I'm going to use the photo that accompanies this blog column as an example. Lisa spent almost 2 hours cutting the pieces, sanding, and putting them all together. Then, she cut the plaque to fit the front. Once done, she brought it upstairs to the Bodacious DIY Dog Mom Project Workshop so I could work my magic. I applied 2 coats of paint to both the toy box and the plaque. I added pawprints around the entire toy box. I detailed the plaque with lettering. Then, I coated the entire DIY Dog Toy Box with 2 coats of protective varnish. I posted it on my Facebook page as an Up For Grabs item. We offered local delivery and pickup and shipping. I think $13 was a very reasonable offer considering that we bought the lumber and supplies to make this. In addition, I spent time painting and detailing. There have been many times when pieces we've created sell within seconds. Other times, hours and days before they sell. Sometimes, they don't sell at all and I get frustrated. I. Do. Not. Give. Up. Art feeds my soul. I love to create cool and beautiful things. Back in January and the first part of February, I didn't spend any time in the Bodacious DIY Dog Mom Project Workshop. I missed it. A. Lot. When Lisa cut and sanded some wood pieces for me and made birdhouses and the doggy toy box, I immediately dove in. I will continue to work my magic in the Bodacious DIY Dog Mom Project Workshop whether stuff sells or not. We take some of what doesn't sell and display it around our home. Or, we give as Birthday and Christmas gifts. At the end of the day, it all works out.